Truckee is nothing if not an iconic mountain town. Once a wild logging burg, Truckee is now the central gateway to the North Shore of Lake Tahoe. Historic Downtown boasts some of the best shopping, dining and entertainment venues in the region, yet the town remains steadfastly independent minded. Home to a large local population, Truckee residents can do everything from bike, to hike to kayak in the summer and snowshoe, cross-country and downhill ski in the winter. And just like the locals, homes come in all shapes and styles. 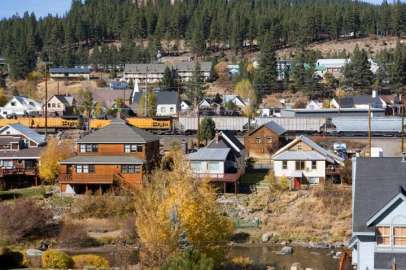 Central Truckee is full of charming, old-fashioned homes just steps from commercial row where tourists and locals mingle at the tasty eateries, bars and shops. Just one mile from Truckee on Brockway Road (old Highway 267), both Sierra Meadows and Ponderosa Palisades share the same entrance and exit, but they each offer different services. Sierra Meadows has a homeowners association while Ponderosa Palisades has more trees, no association and no amenities. Sierra Meadows population is mainly composed of full-time residents living in single-family homes and larger cabins. HOA amenities include a heated pool, tennis courts, volleyball court, playground, clubhouse, and picnic area with barbeque. One of Truckee’s most desirable neighborhoods, Ponderosa Palisades offers affordable primary and secondary homes one mile from Historic Downtown Truckee. This family-friendly neighborhood has 400 homes, with lots from .25 to 1.7 acres. In addition, there are two subdivisions – Ponderosa Ranchos and Martiswood Estates which are accessed through the Sierra Meadows and Ponderosa neighborhoods. Zoned for horses, these upscale areas offer a mix of primary and second homes. There are also several condominium projects located within close proximity to Sierra Meadows and Ponderosa Palisades. Stonewood, developed a little over 10 years ago, offers 2 and 3 bedroom units. Jeffrey Pine Road townhouses which were developed back in 1982 offers 2 bedroom units. In addition there are several new developments offering 2 to 4 bedroom units. These include The Timbers, Riverview townhomes, Tahoe Mountain Meadows and the upscale Pinyon Creek townhomes.